This page presents the Holistic Pattern Mining Patterns, a pattern language for mining patterns based on a holistic approach. The act refers to the process of extracting the whole of the practical knowledge in a certain area of expertise through the experiences of the people in the domain. This language consists of 10 patterns describing ways of finding and solving problems for pattern mining. In this paper, we will refer to the following pattern language projects as cases of holistic pattern mining: the Learning Patterns, the Presentation Patterns, the Generative Beauty Patterns, and the Collaboration Patterns. 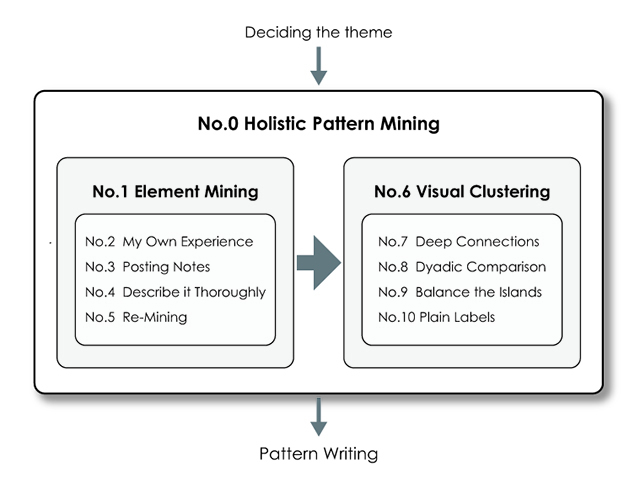 The Holistic Pattern-Mining Patterns we propose here consists of 10 patterns: Holistic Pattern Mining, Element Mining, My Own Experience, Posting Notes, Describe it Thoroughly, Re-Mining, Visual Clustering, Deep Connections, Dyadic Comparison, Balance the Islands, and Plain Labels. You are about to start on making a new pattern language. You can't get the whole picture of the theme just by writing the patterns out based on your own experiences because you don’t know how much of a conceptual area your ideas cover. Since patterns are mined out of the experiences of individuals, its level of abstractness or its relationships with other patterns cannot be determined without having a grasp of the whole. Take a holistic approach to mine out all rules, methods, tips, and customs of the area. Organize the mined out ideas and grasp the whole before you try to write out the patterns. CASE: Many of the pattern languages that have been created in the Iba lab at Keio University, namely the Learning Patterns, the Presentation Patterns, and the Generative Beauty Patterns have all taken the holistic approach. The production process of the Learning Patterns is described in our past paper (Iba and Sakamoto, 2010). The Collaboration Patterns project, also taking the holistic approach, is now still in the production stage, but its progress can be viewed at our website. You are holistically mining out the rules, methods, tips, and customs of the target domain. You can't get the whole picture of the theme just by writing the patterns out based on your own experiences. Since patterns are mined out of the experiences of people, mining alone will tend to lean towards one direction, making it hard to understand the whole. Collect members who have expertise in different parts of the target domain, and mine out all rules, methods, tips, and customs of the area as a team. In this stage of creating a pattern language, quantity is valued over quality. By having team members give positive feedback, a warm environment that encourages more ideas will be made. You can give and receive add-ons and constructive criticism to ideas, triggering more ideas to be produced, since some members have more knowledge than others on specific areas within the theme. 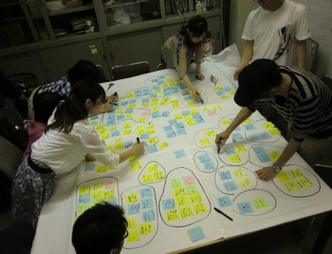 At the end, by combining each member’s expertise on various parts of the field, the whole can be easily constructed. CASE: The Learning Patterns, Presentation Patterns, Collaboration Patterns, and the Generative Beauty Patterns projects were all made by teams of lab members with expertise about each of the subjects. 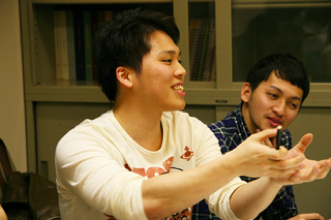 In these projects, members gave positive feedback when other members shared their ideas during the brainstorming stage. Words of agreement, understanding, add-ons, and approval were given among members. 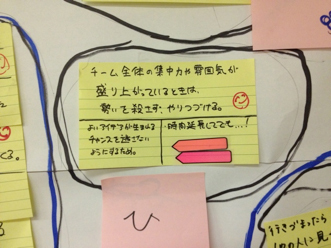 Parts of this positive atmosphere of the Collaboration Patterns can be viewed in our video. You are trying to think of a rule, method, tip, or custom about the theme. You are apt to think of common or general statements rather than attributes coming from your actual experiences, resulting in patterns which lack reality. Stories you've read in books or heard from someone else come up in your mind, and you are tempted to talk about these even though you personally haven’t understood its importance yet. When presenting your idea, give examples from your experiences as well. If the original idea was from someone else, speak of how you’ve applied it to yourself and tell examples of it. Write out the examples onto the sticky note so the meanings can be easily recalled. CASE: During the Brainstorming stage of the Learning Patterns, the Presentation Patterns, and the Collaboration Patterns projects, members only gave rules, methods, tips and customs based on their personal experiences. For example in the Presentation Patterns project, the pattern Success Imaging says to imagine yourself successfully giving the presentation when preparing for it. The member who wrote the original note that later became this pattern also gave specific examples of personal experiences of presenting at conferences and giving dance performances. Though what was written on the note was somewhat abstract, the reality that his episodes had allowed members to clearly remember what the pattern meant, making it easier to write the pattern. Your team wants to mine out as much ideas about the theme as possible. You don't get much progress from just plain talks. Little is left after long talks, and the conversations tend to go off topic. Spread out a large sheet of craft paper, and stick notes on it with your ideas written on them. When you have an idea, write it down on a sticky note, talk about it briefly, and post the note on the paper. It is important to write them on small adhesive notes so they could be moved around later in the Visual Clustering stage. For visual aid, use notes of a variety of color, and write with a thick black marker. By writing the ideas onto notes, records of the topics discussed can be kept. Topics of conversations will be centered on the idea on the current note go less off track. Transitions between ideas can be marked with a new note so the process goes on smoothly. CASE: Brainstorming sessions using sticky notes were held in the Learning Patterns, the Presentation Patterns, and the Collaboration Patterns projects. Various colors of 3x3 sticky notes and the same thick, black marker was used for all projects. 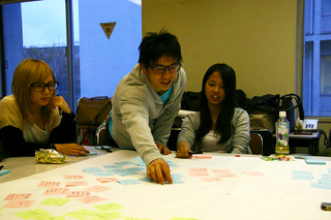 In the Collaboration Patterns project, members went through 2 sessions of brainstorming, for a total of seven hours, resulting in over 360 notes each filled with ideas about creative collaborations. A video of the process can be viewed online. In the Generative Beauty Project, we took a similar but different approach. 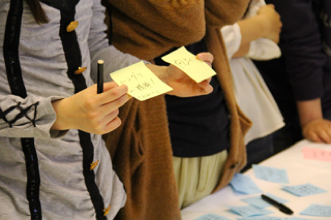 Project members not only wrote their ideas on how to live beautifully as a woman onto the sticky notes, but also attached photos of items they use to represent the idea. You are trying to write out your rule, method, tip, or custom onto a note. The notes become too abstract and you cannot remember what the notes mean when you look at them later. At the time of writing the note you have a concrete image of your idea and you feel the note can be understood even if it's written shortly. 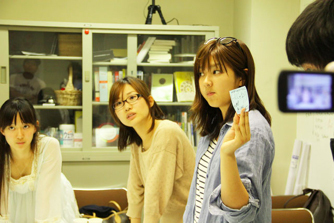 Later on when you or some other member looks at the note, it is not easily understood as when the note was written. Write out the notes in proper sentences, usually in an imperative form. Write them in the verb form telling the reader what should be done, rather than a noun that expresses the idea. The sentences not need be long, but they should be sufficient so the idea can be clearly remembered when seen later. Add on any examples that came up in the conversation that would help remember. CASE: During the brainstorming process of the Presentation Patterns, and the Generative Beauty Patterns, the members did not place ant restrictions on how the notes should be written. As a result, confinements and arguments arose over what the notes really meant, especially when the notes had only single nouns on it. Members had to rewrite the same pattern over many times due to this. To avoid such a situation, members of the Collaboration Patterns Project agreed to write all notes in the verb form telling concrete actions to do so no misunderstanding happens. Your team feels they are done giving the rules, methods, tips, and customs out about the theme. Looking at the whole image of the subject, you have a feeling that some pieces of it are missing. The chain of thoughts up until then causes ideas to be biased towards certain subjects. The goal for pattern languages is to get an image of the entire subject, so having pieces missing here and there would be a problem. Hold another brainstorming session considering the missing part as the theme this time. This would make ideas centered in the missing parts more likely to be produced, and the whole would be reinforced. 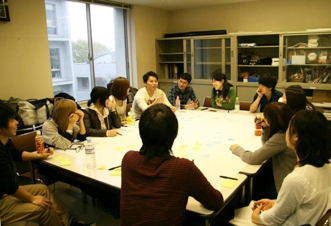 Having shepherds or adding more members may be effective since they could give their opinions and ideas about the topic from a different point of view. CASE: During the production of the Generative Beauty Patterns, members shared their rules, methods, tips, and customs on “being beautiful and lively.” After the first brainstorming session, they realized their ideas were far weighted on the “being lively” side of the topic. 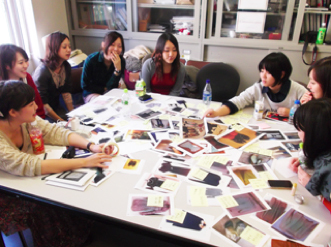 Taking this into account, the topic for the next brainstorming session was focused on the ”live beautifully” side, namely ”fashion models,” “clothes,” “cosmetics,” and “hair styles,” and went through a process of re-mining. 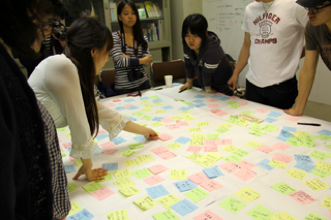 Your team has finished brainstorming and all of the ideas are now posted on the paper. With the number of notes on the paper, it is impossible to sort out their relations in your head. Yet straight up categorizing the notes would defeat the purpose since it may cover up the true relationships and similarities between notes that would fall in different categories. Visually express the distance between the meanings of each note. When talking about the relationships between the notes, show their semantic distances on the large piece of craft paper by moving notes with similar attributes close together. This makes it possible to talk about the notes by considering the visual relationships between them. By continuing this process, the notes will start to form clusters that would each later become a pattern. CASE: The Learning Patterns, Presentation Patterns, Collaboration Patterns, and the Generative Beauty Patterns projects all went through a process of visual clustering. Specifically in the Collaboration Patterns project, members went through 4 sessions of clustering for a total of 20 hours. 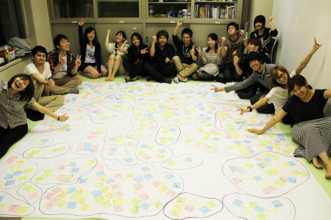 Members spread the notes produced in the brainstorming stage on the floor to gain enough space to cluster the 360 notes. This process can be viewed in our video . You are considering the distance between the meanings of two notes. You are tempted to pair up notes that contain similar words and phrases, and are blinded from their true meanings. You would then be combining what potentially needs to be two separate patterns into one. Always think of the notes in terms of the reason it is important, and less about the actual actions being taken. Think of the distance between the notes in terms of similarity in its Problem or Context, and less about its Solution and Actions taken. CASE: For example in the Collaboration Patterns project, a note about responding to emails quickly should not be grouped with a note that states the importance of exchanging email addresses so everyone can be reached when needed, just because they both are talking about emails. It is better paired with a note saying that feedbacks should be given constantly and immediately, since the point here is about giving responses and not so much about the email. Notes are moved around and you start to see small groups of notes forming. You are tempted to move a note close to a group of notes rather than another single note. The uneasiness from having notes not yet associated with another rushes you to group the notes more quickly, but associating a note to a group of notes can easily blind you from the actual connection between the notes. Compare notes based on a one-to-one relationship. Always keep in mind that it is the relation between two specific notes that must be talked about. Prohibit members from talking about the general area that a note should go, or using words like "~ish" ("pattern-ish") or "~y" ("collaborationy") that talk about the superficial category of the notes. 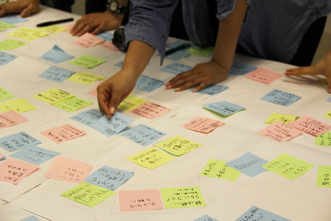 CASE: When going through visual clustering in Learning Patterns, Presentation Patterns, Collaboration Patterns, and Generative Beauty Patterns Project, members were always tempted to bring a note close to a group of notes that had already formed. Members emphasized the importance of thinking of the dyadic relationships between notes before each session, and pointed out when other members had forgot about it. Your group has finished moving the notes around, and you are about to circle around the semantic groups (islands: these each become a pattern) of notes that have formed, to name them. You become too focused on the groupings that the levels of meaning of the islands become inconsistent. Islands have different levels of abstractness, or the areas of ideas they cover have large variances. Having scattered islands would result in the product patterns to be un-uniform in abstractness. Consider that these islands become individual patterns, and make the level of abstractness even at the appropriate level. If one island contains too many ideas compared to other islands, consider breaking the pattern up into two separate patterns. On the other hand, for islands that only contain notes that are too specific, think of a more general label that represents the group. CASE: The level of abstractness of the islands have been important in all of the Learning Patterns, Presentation Patterns, Collaboration Patterns, and the Generative Beauty Patterns. When clustering the notes, it is how specific of an idea the notes state that is important, and not much the number of notes in it. As a result of the effort to equalize the abstractness, the sizes of islands had large variances where some islands had multiple notes in them, while other islands were composed of only one note. You are thinking of a label for an island of notes. If you use straightforward nouns as labels, it is hard to remember what the label means when writing the patterns later on. If you have named patterns in the past, you tend to give nouns that may become a future pattern name as labels for the islands. Giving such names would distract the writer away from the pattern's real contents during the pattern writing process later on. Label each island thoroughly so they express the idea written in it clearly. Writing the labels in the command form will help make it short and clear. Keep in mind that these are just temporary labels used at the stage of writing the patterns so the writer can understand and distinguish patterns at a glance. There is no problem even if it gets a little long or ordinary. The pattern name will be later given after the pattern is written. When the label is written for all of the islands, the tea can now go on to the pattern writing stage. CASE: When labeling for the Presentation Patterns, members decided to give the clusters a candidate for its future pattern name, instead of a label that describes what the cluster means. The creative names (usually a noun) that were given to the clusters ended up generating confusion to the members. Since an attractive pattern name takes time to think up of, members gave temporary names to the clusters that necessary didn’t represent its meaning well. Confusion and misunderstanding occurred among members as a result, negatively affecting the actual contents of the patterns. With this failure in the past the Collaboration Patterns project members worked on giving a label that describes the clusters thoroughly. Thinking of the creative pattern names will be put off until later in the process, so members can concentrate on writing out solid patterns.